This is getting depressing. We've had nothing but rain it seems since mid-April. Now it's been 10 days since I got my new ride - and it's rained every day but 1! I'm sick of cleaning and polishing, I want to put some miles on! I want to scrub the nubbies of the new tires! I want to go to Pakenham for an ice cream! I want to ride! Clearly the product liability lawyers have been busy, but they’ve still missed a few. Nowhere in the manual did I find this warning: “Purchase of this motorcycle without the express prior permission of your spouse/significant other may result in death or serious injury”. Or how about: “Operating this vehicle at excessive speeds while removing the bugs from one’s teeth may result in death or serious injury.” Then there’s: “The installation of excessive chrome attachments to this motorcycle may cause blinding reflections resulting in death or serious injury”. Note to H-D: Feel free to use the above warnings in future manuals without attribution. I can’t believe it’s been two weeks since I last posted. Well, actually, I can. Like the politicos chomping at the bit to get the hell out of Dodge, I too have succumbed to a deep malaise concerning all things political. It’s just too damn infuriating and tiresome to sustain any level of interest in the moronic happenings on the Hill for more than a few months at a stretch – and I hit the wall about 3 weeks ago. So instead, I turned my attention to a far more interesting topic – motorcycles. Harley Davidson motorcycles to be specific. Ever since I first rode one back in the 60’s (yeah, I’m that old) I have nursed a not-so-secret desire to have one of my very own. So decades (and 20 or so other lesser motorcycles) later, I decided this was the year, and so the search was on. But eventually I found exactly what I was looking for in Toronto. 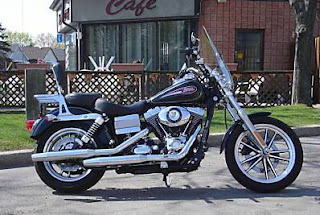 So a quick trip for a look-see, followed by a handshake and an arranged delivery/hand-over in Kingston, and I am now the proud owner of an ’07 Dyna Low Rider. I’ll be seeing you on the road!